This month’s open thread. We’re going to guess that most of what people want to talk about is related to the IPCC WG1 AR5 report… Have at it! I have just published a review what the IPCC WG1 report writes about my area of expertise (homogenization of station data). I personally expect uncertainties in the global mean temperature to be larger, but would say that the IPCC gives an honest summary of the scientific literature. That is what the IPCC is supposed to do. Such reviews are a good way to judge the quality of an information source. Please help me by finding or writing further reviews. Victor is the a WUWT fail compilation? Thanks. Btw what kind of climate sensitivity is used in the RCP scenarios? On the bottom line, it should be more clear that we heading to a early Pliocene state (+20 m SLR). Re +2 C is a disaster target. The new report illustrates how crucial the ocean – atmosphere interaction is for the atmospheric temperature development. Are there any analyses about the uncertainty range that the heat exchange between these two creates? Is that included in the spread of temperature constructions in the model runs? If not, is there any idea about the possible rates of acceleration or deceleration due to changes in ocean uptake? Gavin et al., In all of the copious spare time you will undoubtedly have during the shutdown, might you consider an update on developments in climate sensitivity? In looking at new developments in the latest IPCC report, one notable change is the decision not to give a single best estimate. The denialosphere has gone ape caca over this. However, there is actually something interesting here–that is that the distribution of sensitivity estimates has bifurcated in the last 7-8 years. During this period, you have several estimates that find relatively low sensitivities (1.5-2.3) and several estimates with sensitivity in the 3-4.5 range and not much in between. What’s going on? seems to support this, as do the studies showing more significant warming in the deeper oceans. prokaryotes, as far as I know, a list with WUWT fails does not exist yet. It would be nice if someone would make a list. Or maybe someone can make a pre-selection and then everyone can vote for his favourite WUWT classics. I only have a few posts on misinformation by WUWT. The experts are: Wotts Up With That Blog, Hotwhopper, Wott’s Up With That?, What’s Up With That Watts?, VVatts Up With That. They regularly explain WUWT’s errors. According to the IPCC homepage, the section of WGII that addresses ecosystems effects will be released in March. Does anyone know of any recent papers that deal with ecosystems and anthropogenic global warming (AGW)? A review paper would be ideal. On the mitigation front, there were nine legal challenges to the EPA’s current plan to reduce AGW pollution. All were rejected, so the small amounts of progress will continue. Could you say a bit more about this, please, as it strikes me as being a particularly important point. For example, what difference is being used to distinguish between a “rapid” equilibrium time and a presumably longer time (but higher sensitivity). We’ve known for a long time that a rapid equilibrium time tended to imply a low sensitivity–that is the mistake Schwarz made. The thing is that it all depends on how long one must wait for the system to approach closely enough to equilibrium. If it’s rapid, then whatever temperature rise we’ve had in that period determines the sensitivity. For a longer equilibration time, we heat the air and shallow ocean, then the deep ocean, then the air/shallows some more and so on. Slower feedbacks come into play. This latter scenario seems to be what is going on wrt the Skepticalscience escalator. Anyway, this is the way I understand things. It also seems to be supported by the study in Kirk-Davidoff. And if this is the case, then depending on what data you use, you will get a sensitivity in either of the two modes. There have been a lot of fires. Australia, California, Denver, etc… I would be surprised if they didn’t effect the climate and weather. Perhaps causing some cooling? The soot certainly transfers heat into ice rather than bouncing it back up into the air. Is fire smoke different than volcano smoke? Can you find this in the GRIP ice core data? Thanks Victor for the overview, but please don’t hyperlink to WUWT, part of this is the reason why WUWT is listed on many climate related search queries at Google. Use a link shortener instead. The misjudgement and the debunked claims from WUWT should be used to derank WUWT at Google. What is missing is a website which explains current climate science – on a daily basis – accurately, written for the average Joe. AR5 is an amazing collaborative achievement. The report was released on Friday, (when most news wishing to be buried appears). During press coverage, the IPCC consensus was compared to the views of the usual suspects, without voice to those who believe that the situation may be a little more dire than RCP 8.5. A general lack of discussion in the media about the unknown implications of albedo change, future ice sheet dynamics, and other feedbacks is understandable given that these concepts are not well understood; the IPCC ignores chaotic factors in its assessment. In translation to a social context this scientific rigor unfortunately downplays the severity of our current situation, and promotes inaction by the public. ie “A RCP 2.6 is possible too and didn’t you say the temperature is not rising very quickly”? An average citizen does not understand the social transformation required to attain RCP 2.6, nor the consequences of a 4 degree C change by 2100. The vested interests surely wish to obscure the truth. My question is; how can the findings of climate science be effectively communicated more frequently than the IPCC in a language that can transcend propaganda? Sincere thanks to those who seek truth! Many thanks for this, it makes sense. I’ve been concerned for a long time that the sensitivity is higher than supposed, and likewise that the mixing of the extra retained heat within the Earth system will be very complex and take much longer than supposed. Anyway, I’ll try to have a look at the Kirk-Davidoff paper at some point, and get this clearer in my mind. @1 Victor, thanks very much for the nice review! Please note, IPCC did not a review but an assessment! The IPCC report is not making it very clear that the lack of projected ground temperature records is related to the current IPO state, which distributes heat energy to the deep sea rather than atmosphere. Do these models of the past, account for that IPO related heat distribution? 1. ENSO: The negative trend of ENSO over the last 15 years can explain – depending on the analysis – from only a small contribution (Fyfe et al. 2013) over about two thirds (Foster and Rahmstorf 2011) to almost all (Kosaka and Xie 2013). 4. Heat uptake by the ocean: Some studies explain the slow-down by heat uptake in the deep(er) ocean. This explanation involves important uncertainties and relatively short time series in deep ocean measurements. It is important to note that this explanation might overlap quite strongly with the influence of ENSO, since the ENSO effect mainly works through heat exchange with the ocean. 5. Overestimation of climate sensitivity by (some) climate models: there is some evidence that at least some climate models might overestimate climate sensitivity. However, this can hardly explain the slow-down (i.e. a strong change in the trend), since climate sensitivity of the models has not changed in the year 2000. The argument is the other way round: the slow-down might point to a somewhat slower climate sensitivity, because it lowers the long-term trend over 50 years or so. In summary, external (solar volcanic) and internal variability (ENSO) might well explain the slow-down, since the latter is by far in the combined range of explanations 1-3. – Volcanic aerosols / solar activity: Both factors influence solar irradiation, which has its strongest effects in Northern hemisphere summer, therefore this is inconsistent with a main effect in winter. – Heat uptake by the deep ocean: at first sight I can’t see a reason, why this should have a distinct effect in winter. While mixing and heat uptake in the upper layers have seasonal characteristics, the mixing down to deep layers might less depend on seasons. Any thoughts by oceanographers? – Climate sensitivity: I don’t know an effect explaining a distinct winter effect. BTW, the two modes are centered at roughly 2.16 and 3.64 degrees per doubling–even the lower mode is not cause for celebration. I have just written a long blog post about linking to WUWT and Co: NoFollow: Do not give WUWT & Co. unintentional link love. In short: you can link to WUWT in comment below blogs. The software typically automatically adds a tag NoFollow, which tells Google not to count this link as a recommendation. URL shorterners do not always have this effect. In Forums you sometimes have to add the NoFollow tag yourself. In a blog post you always have to add it yourself. There are apps to help you see which links as NoFollow and which are DoFollow. A blog with daily climate science would need funding. WUWT can report daily because they do not have any quality standards, but a pro-science blog would have to have standards. ThinkProgress Climate reports daily about climatic issues, both science and politics. Juerg, I am just a scientist and also not a native speaker. What is the difference between a review and an assessment and a synthesis? Victor, that is interesting and thanks for pointing latest linkage features out. CP is a good blog but the scope is somewhat to specific around Washington politics and Energy. There are many different concepts but most can be considered to be publications from academic sources written for this audience. What i have in mind is a bit like HuffPost or The Guardian, but both sources only cover climate within a broader news coverage. Preaching to the choir. I haven’t gone to Tony “Micro” Watts blog in years except by accident. I am beginning to think the latter, and so are several other analysts. The Southern Oscillation Index (SOI) which you can get a detailed record from NCAR, maps to the vast majority of the fluctuations in the GISS global temperature record. Since the SOI has a reversion to the mean property and the mean is zero, when used as a correction to GISS it essentially completely wipes out the pause-like variations leaving the warming trend behind. A tool such as Eureqa is fun to play around with and will do all the compensation automagically. I have been pushing this view at Curry’s blog, and some denier said that GISS is already doing this SOI correction in its data set and that it was a fudge. I responded that if they are, they can certainly do a lot better! #24 I am wondering if the world climate might simply had shifted from a state to another around that date. Tamino graphics from Kosaka and Xie 2013 seem to indicate the present slowdown in winter is anomalous. Do we have pass trough a magic door without noticing it? Quite so, Ray, neither figure is at all reassuring. It perhaps could be pertinent that the decline in sea ice and the ‘slow down’ both appear to be challenging climate models. We can be a little more precise about the timing of the ‘effect’ during the winter. If you look at the GISS NH data by the month, the period that is responsible for most of the ‘slow-down’ is actually December to February. HadCRUT4 gives similar results although March has been showing more decline in the last couple of years than it does within GISS. With all the fluctuating values, the year of the start of this phenomenon is more ambiguous from NH anomalies for individual months of the year. Feb has been declining since 2000 but most months are turning nearer 2006/7. Geographic data may show further clues regarding the start year. 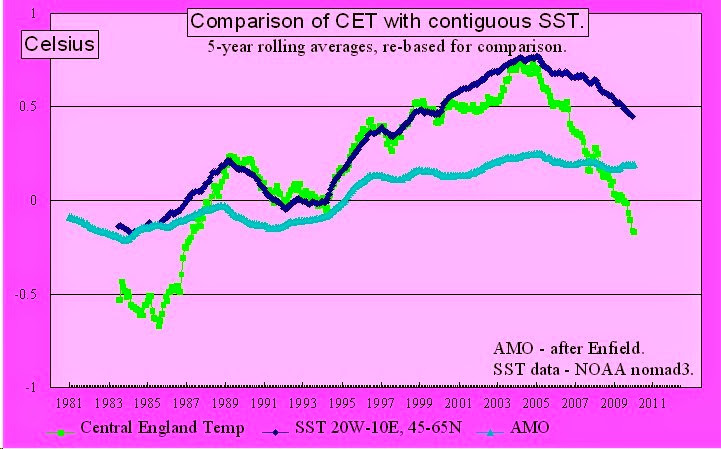 For instance, this graph shows the CET 5-year rolling ave anomaly & the SST for the surrounding seas turning down in 2005. An alternative that may be doable and would be interesting would be a weekly podcast on climate. An example could be Econtalk. Typically, they discuss a recent article or book. From the article you learn economics, from the discussion scientific thinking. Especially in the podcasts where the libertarian host is confronted with reality, the discussions can be quite enlightening and interesting. I could imagine that RealClimate could do something similar for climate. The Climate Abyss has made a beautiful plot showing the relationship between global mean surface temperature and SOI. By given El Nino and La Nina years a different color and symbol you can see the influence of SOI, without having to “fudge” the data. X says this and that and such and so, agreeing with Y who says this and that and such and so but disagreeing with Z who says this and that and such and so. X and Y are wrong. Z is correct. X,Y and Z are all correct. At the time, the paper was heavily criticised by this blog and others both on scientific grounds and, as far as I can tell, because the arguments advanced might be misused by climate scientists. At the time, when I read the paper, it seemed clear to me that the predicted offset of warming would be TEMPORARY, so I could not understand some aspects of the criticism. Frankly, to an outsider it looked like a little bit of jealousy and professional rivalry between modelers about a high profile paper. I wonder whether now, given the pause in warming which is being attributed to atmosphere-ocean interaction and subsurface heat storage changes, whether it would be worth a reinvestigation of that 3-5 year old debate. Personally, as a non-modeler, I suspect that a little less grandstanding by this blog and others would have been appropriate, given the way things have worked out to date. That is a nice qualitative view. One can further reduce the variability of the GMST by subtracting out the AMO Index. This is more questionable though because the AMO Index is detrended from SST so the variability reduction may be baked in. The smooth curve was the trend calculated by Eureqa. #3,#8. There is a list of WUWT fails…it’s called WUWT. @21 who wrote: “the slowdown is more or less restricted to the Northern hemisphere winter” – that highlight may be the boat anchor, but the observations were clear: the Jet Stream went haywire with enormous north-south gyrations and breakdowns. Record-setting cold spells snapped south into Siberia and flooded west & south (snow in Libya). Iirc, 2010’s record high tail-ended with the opposite – a northern hemisphere ‘summer in winter’ when the Jet Stream buckled. The mission is really to determine if the La Nina’s and the Jet Stream anomalies are linked, or collateral co-incidences. NOAA monthly climate recaps would be helpful, but they’ve been shut down by the pro-pollutionist TeaPartiers. It’s worth checking, if America ever gets back its democracy. I feel a bit disapointed, the AR5 makes me feel as if I couldn’t read. I’ve been spending the last 5 years on the net denying there was any hiatus in temperatures, defending that the latest estimates of future sea level rise were more than 1 meter, that climate sensitivity estimates were the same as in AR4 and that the model ensemble wasn’t running too warm. 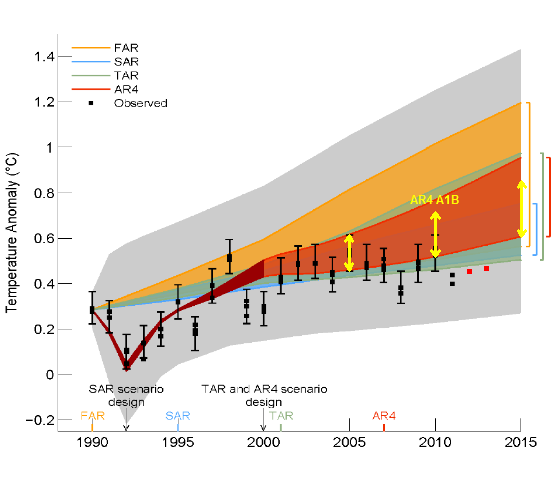 Now the AR5 acknowledges that there is an hiatus in temperatures and that a possible source of error are models; projected sea level rise is lower than 1 meter and semi-empirical models are disregarded; the lower bound of likely sensitivity is 0,5 ºC less and there’s no “most likely value” any more (however, in the combination section (Box 12.2 Figure 1 bottom) you can see that combined results tend to lie below 3ºC, with one result lying even below 2 ºC and no result above 3 ºC; it also seems that some climate models of the ensemble are inconsistent with observations (running too warm) (Chap. 11, p 23, about the ASK apporoach). I understand that the basic message (the politically relevant) remains the same, but then I don’t see the point of arguing with the deniers about the nuances (how fast things will hapen). Have looked at the Climate Abyss site – http://blog.chron.com/climateabyss/2012/04/about-the-lack-of-warming/ – and it is a very striking presentation of the data, well worth looking at. Not much sign from that of any pause in the rate of warming. Not much in there about a pause in global warming either. I do just wonder how well the current GCM’s can account for increased acidification of the oceans and the likely reduction in CO2 drawdown that might result. I have just been trying to link from a Wiki article to the (USA) NAOO. Is this the real reason for the temperature pause? Here is the executive summary from the State of the Ocean report 2013 by IPSO. “A better understanding of the stratospheric water vapor feedback could help explain some of the spread among predictions of future climate change from different models,” referring to the projections made by the recently released 5th Assessment report of the Intergovernmental Panel on Climate Change (IPCC) last week. Since Drew Shindell (NASA) wrote on this over a decade ago it would be great to have some input from him on the latest water vapor methane connection in the stratosphere. Wow, the US gov shutdown, it affects education and science. This is a teachable moment, an opportunity to explain that the warming signal is small compared to natural variability, but that the warming signal is a trend, that can be detected with enough data points. How many data points? More than 15 for annual global temperature data (at one point per calendar year), usually, although it’s possible to cherrypick to find, or avoid, results. That’s right out of Statistics 101. And you can explain that natural variability averages out to zero trend — over periods longer than fifteen years. How many? More Statistics 101. And then you can explain how long we’ve known about CO2 and the climate trend. Then point out how they can be misled if they believe the stuff constantly being shoveled out by Morano — and, to be clear, you can point out that there have been for many years sincere, worried and concerned people who have been exaggerating what we can know. Maybe that is what this is all about. I’m not up-to-date on your policies but Chris Dudley has posted links about nuclear power (not obvious unless you check them out) over at the September Unforced Variations in the last few days which were followed by discussion of nuclear power as people read the links.